On 15 May Transparency International India invited senior figures in the defence establishment, including Defence Minister A.K. Antony, senior oversight officers from both state-owned and private defence companies, and experts from civil society to discuss the issue of corruption in defence procurement. There have been too many scandals in procurement – the AgustaWestland helicopter mess is just one – and not enough transparency in how the industry and the government conduct business. We believe this has to change. India’s Defence Minister A.K. 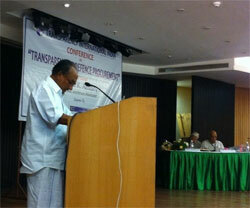 Antony speaking at Transparency International India’s conference on 15 May. The bottom line is that citizens do not get what they need: National security is too often an excuse to hide corruption, and bribes are easy to conceal within defence contracts. Citizens have a right to know how their money is spent, and that defence forces are there to protect and serve them. India’s Defence Minister A.K. Antony admitted in the conference that corruption in this sector – as well as in almost all walks of life – has severely eroded the image of the country. He also stressed that citizens play a key role in fighting corruption, and should make the government more accountable by using the Right to Information (RTI) law further. With the ongoing investigation into the AgustaWestland scandal alleging that over US$67 million may have been paid in bribes to CEOs, middlemen and the family of former Air Chief Marshal S.P. Tyagi, Minister Antony also acknowledged in the conference that the country has banned middlemen and agents in defence deals in an effort “to end this menace”. Transparency International Defence and Security Programme director Mark Pyman, who also took part in the conference, highlighted the energetic approach India has had in the investigation of this case. With corruption allegations in contracts in big arms-buying nations like India, he stressed how important it is to have a positive investigation following such cases. On the companies side, Pyman wasn’t as enthusiastic. He pointed out that Indian companies such as Hindustan Aeronautics Limited (HAL) and Bharat Electronics Limited did not do very well in terms of articulating their anti-corruption programmes, as shown in our Defence Companies Anti-Corruption Index. Integrity Pacts, an anti-corruption tool developed by Transparency International that prohibit government agencies and the companies they contract with from bribery and collusion, can be a major tool in the fight against corruption in defence as well. Minister Antony acknowledged their importance in contracts between governments and companies in this conference. However, this is not enough. Admiral Tahiliani, former Chair of Transparency International India who also spoke at the conference, said that 45 state-owned companies in India have adopted Integrity Pacts but none of these are from the private sector. While it is creditable that the defence ministry has Integrity Pacts, the very purpose gets defeated if civil society monitoring is not included as an integral part of it. Hardly anyone knows who the appointed independent monitors are. For this instrument to work, we call on the Indian government to include civil society to monitor this process. An energetic approach and concrete actions are indeed needed to improve defence corruption in India. The country scored D+ in Transparency International’s Government Defence Anti-Corruption Index, indicating a high risk of corruption. The research indicates that some anti-corruption mechanisms are in place, but they’re ineffective or poorly enforced. The citizens of India now need him to stick to those commitments, put stronger anti-corruption mechanisms in place, and use his leadership to make sure that they’re enforced. After the scandals of recent years, no less than that is needed for the Ministry of Defence to win back the trust from its citizens.